As we are rapidly approaching another spring season of forage growth, it may be useful to consider some of the issues that affect the assessment of spring forage growth. Since most of the forage in NY is alfalfa-grass mixtures, and most of the forage becomes dairy cattle feed, we are focusing on the optimum timing for harvest of mixtures for high quality dairy feed. High quality alfalfa and grass forage will significantly increase milk production and increase the proportion of homegrown feeds in rations. Fiber digestibility (NDFD) is the most important forage factor affecting milk production. For high producing dairy cows, an increase of one-percentage unit NDFD may increase milk production as much as one pound of milk per cow per day. Higher NDFD in forages can be achieved by harvesting earlier, or by selecting higher NDFD alfalfa and grass varieties. Almost all alfalfa seed companies have a “high quality” alfalfa variety, although there is likely a considerable range in quality among “high quality” varieties. There have been very few attempts to breed grass varieties for high quality, but there are some differences among grass species. Optimum spring harvest should not be based on NDFD, however, but needs to be based on the optimum total fiber content (NDF) of the forage. Rations can be easily balanced for protein and energy, not so easy to balance for fiber. We monitored first production year spring growth of alfalfa and grass in 2017. Alfalfa varieties sown were: HarvXtra-1, HarvXtra-2, Hi-Gest 360, LegenDairy HXD, N-R-Gee, SW315LH, and Pioneer 55H94. Grass varieties sown were: Driftless meadow fescue, Bariane tall fescue, Barlegro orchardgrass, Dividend VL orchardgrass, sparse-heading orchardgrass, Fojtan festulolium, and Perseus festulolium. Alfalfa and grass were grown separately with three field replicates, and grass was fertilized with 100 lbs N at spring green up. Alfalfa quality does not appear to be affected by the presence of grass in the stand, such that evaluation of alfalfa in pure stands should produce similar results to evaluating alfalfa grown in mixtures. In general, grass quality also is not greatly affected by alfalfa in a mixed stand, with one exception. From previous studies, we conclude that grass crude protein (CP) content in alfalfa-grass mixtures is directly proportional to the percent alfalfa in the mixed stand. In a pure stand, grass CP will decline linearly (Fig. 1). In a mixed stand that is predominantly alfalfa, grass CP will not decline as quickly as in a pure grass stand, because of a continuous supply of N from alfalfa. 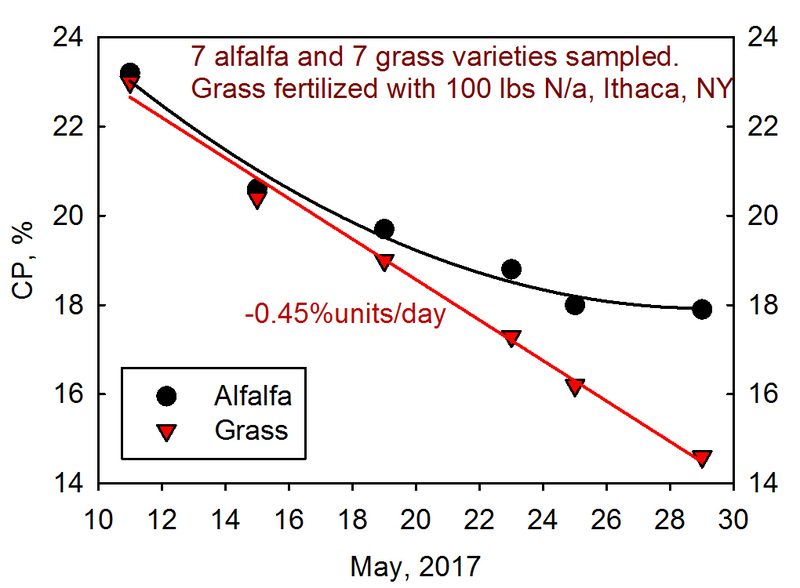 In several previous alfalfa-grass studies in NY conducted on dairy farms, a spring harvest around May 25 consistently resulted in grass with over 17% CP, when the stands were 30% grass. Total alfalfa+grass CP in a 30% grass stand generally exceeds 20% CP at spring harvest. Fig. 1. 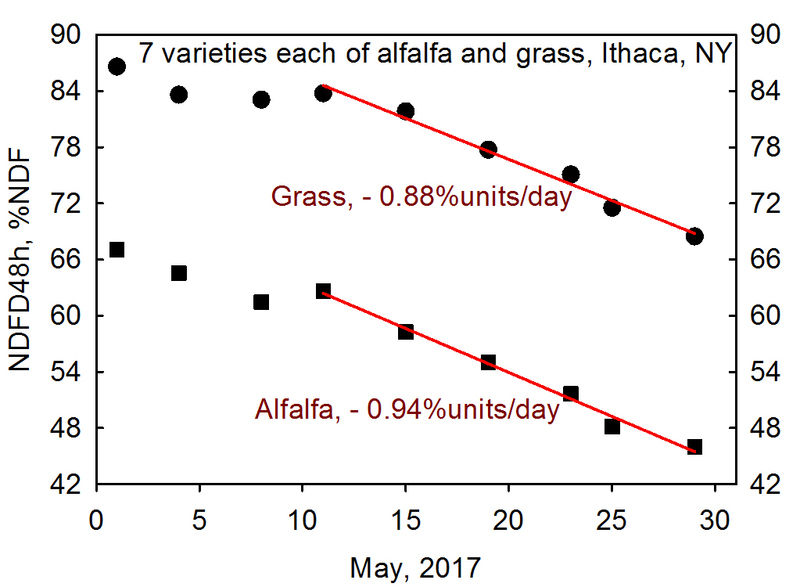 Crude protein content of alfalfa and grass grown separately in spring 2017. Note: Beware, this article contains differences between varieties sometimes expressed as a percentage unit change (e.g. NDFD difference of 54% to 50% = 4 percentage unit drop in NDFD) and sometimes appropriately expressed as a percent change (e.g. lignin difference of 6% to 5% = 17% drop in lignin). In a normal spring, forage quality of both alfalfa and grass will generally fluctuate until around May 10. There may not much to be gained by collecting forage samples for analysis (e.g. scissors-cut samples) the first week of May. After about May 10, NDF and NDFD often show linear patterns of increase or decrease (Fig. 2 & 3). Grass typically gains about 1 percentage unit of NDF per day in the spring, and was relatively normal in 2017 in spite of somewhat abnormal temperatures. Alfalfa, on the other hand, matured faster than normal the last half of May. Alfalfa typically gains about 0.6 to 0.7 percentage units of NDF per day prior to spring harvest. Fig. 2. Below normal temperatures in early May, followed by average and above average temperatures, resulted in alfalfa maturing faster than normal in the second half of May. Fig. 3. Grass NDFD declined at a relatively normal rate in spring 2017, while alfalfa NDFD declined much faster than normal. Although alfalfa was maturing at a faster rate than normal in late May, maturity at spring harvest was similar to a normal year. 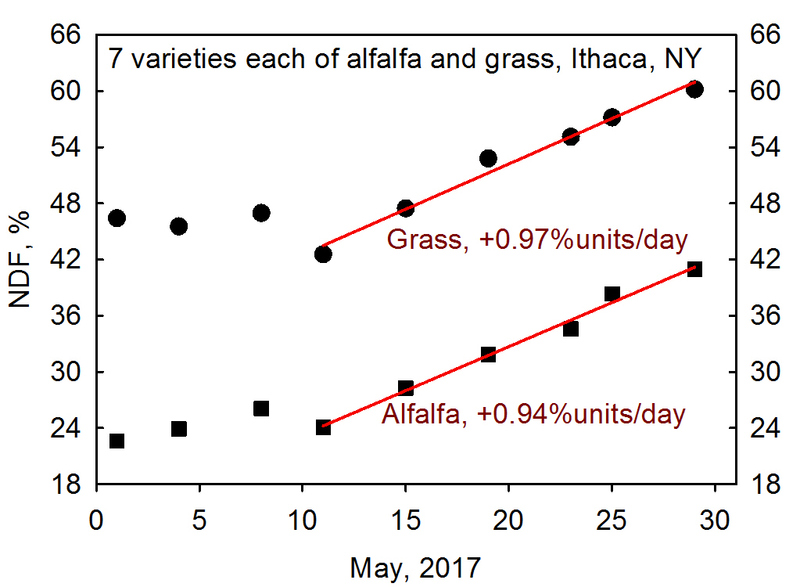 On May 25, a typical spring harvest date for alfalfa-grass in central NY, alfalfa averaged 37% NDF, compared to 57% for grass. NDFD on May 25 averaged 49% for alfalfa and 72% for grass. High NDFD in grass is the primary reason that alfalfa-grass mixtures can result in an excellent forage for high producing dairy cows. 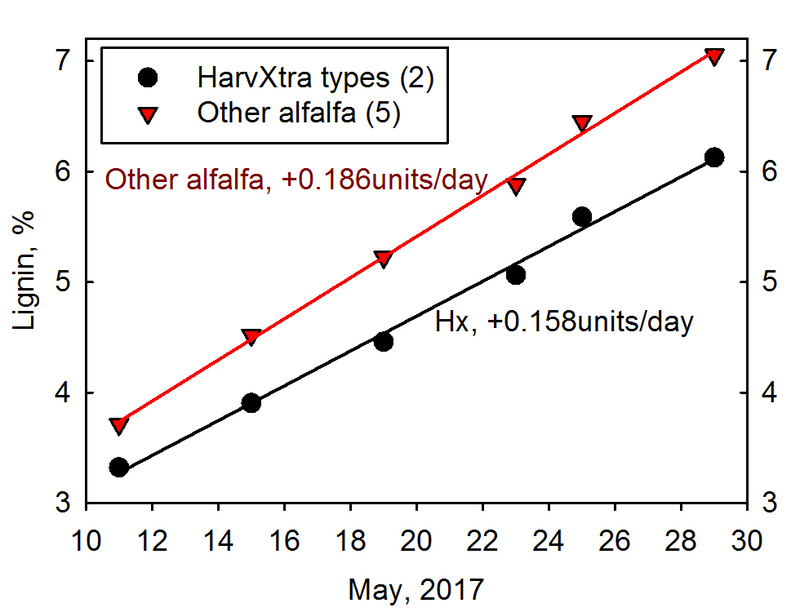 We have found in other studies that HarvXtra (Hx) types tend to be slightly later in maturity than other alfalfas, when measuring mean maturity stage. This leads to a slightly lower NDF content in Hx on any given date (Fig. 4). Hx also has a slightly lower rate of NDF accumulation. 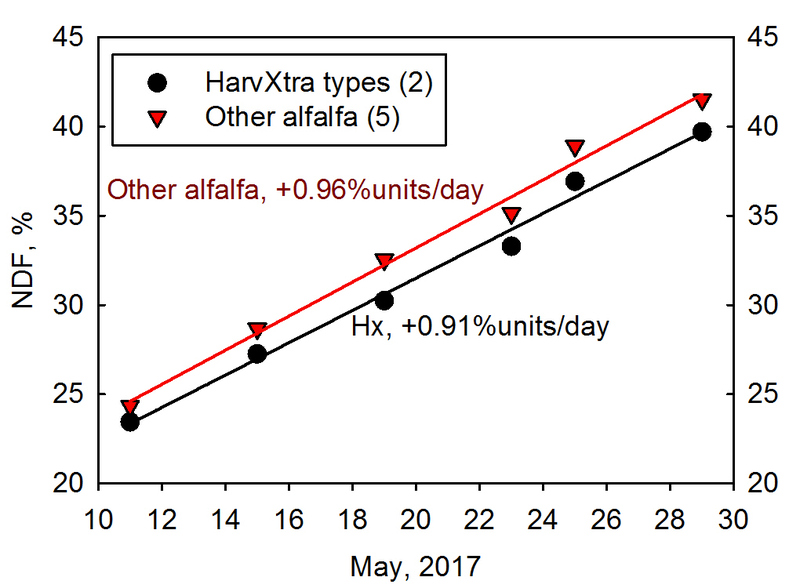 On May 11, Hx is about 1 percentage unit lower, while on May 29 it is a little over 2 percentage units lower than other alfalfas. Fig. 4. NDF accumulation in HarvXtra types, compared to other alfalfa varieties. NDFD of Hx types was consistently higher than other alfalfas (Fig. 5), with a slightly faster rate of decline in NDFD/day. On May 11, Hx was 4 percentage units higher, and on May 29 it was 3 percentage units higher in NDFD than the average of other alfalfa varieties. Fig. 5. Fiber digestibility of HarvXtra type alfalfa, compared with other varieties. 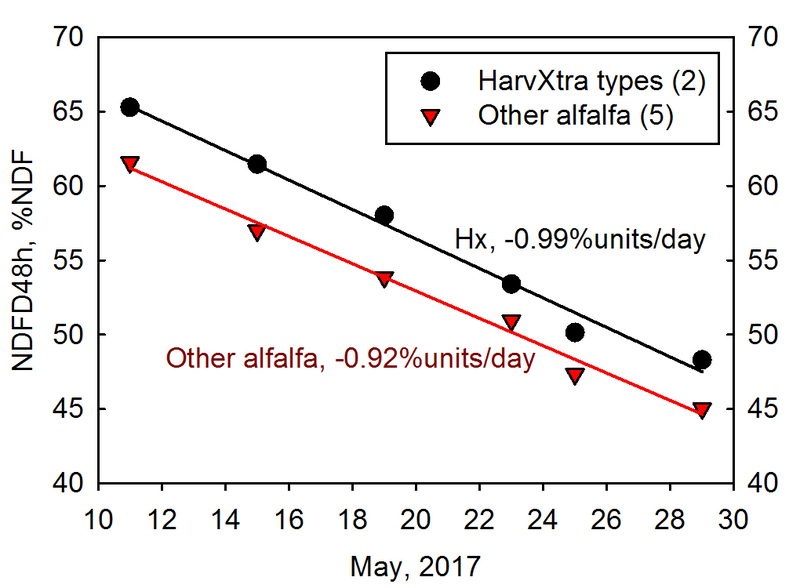 As we have found in a number of other trials, Hx is consistently much lower in lignin content than other alfalfa varieties (Fig. 6). Hx also had a slightly lower rate of lignin accumulation. On May 11, Hx was 12% lower, and on May 29 it was 14% lower in lignin than the average of other alfalfa varieties. Fig. 6. Pattern of lignin accumulation in spring alfalfa growth. In grasses, NDF typically accumulates around 1 percentage unit/day in spring growth (Fig. 7). Grass species in this trial were all similar in NDF content and rate of NDF accumulation with one exception. Perseus festulolium is a ryegrass-type of festulolium very different from fescue-type festuloliums (e.g. Fojtan). Total fiber content is very low in Perseus spring growth, and NDF accumulates at a slightly lower rate in Perseus compared to other grasses. A May 25 spring harvest of Perseus was over 9 percentage units lower in NDF than other grasses. The serious problem with Perseus and probably all festuloliums, however, is the tendency to head out quickly in regrowth, making second harvest festulolium forage much lower in quality than other grasses. Festuloliums are not a particularly good option as a companion crop with alfalfa for dairy cow forage for that reason. Fig. 7. Rate of NDF accumulation in grasses in spring growth. 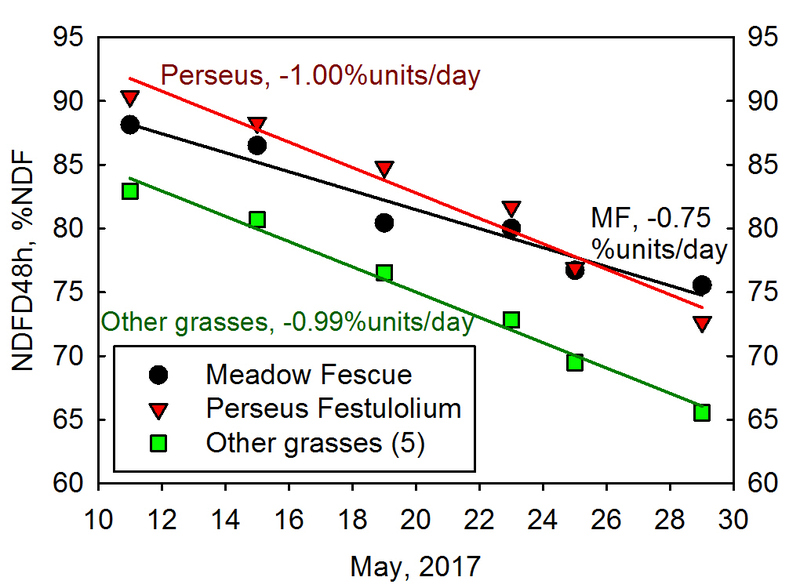 As it is less mature and much lower in NDF, Perseus is also considerably higher in NDFD than most grasses in spring growth, except for meadow fescue (Fig. 8). Perseus is significantly lower in NDFD than other grasses in regrowth, however, due to rapid heading in regrowth. Meadow fescue NDFD appears to decline at a slower rate than with other grasses. 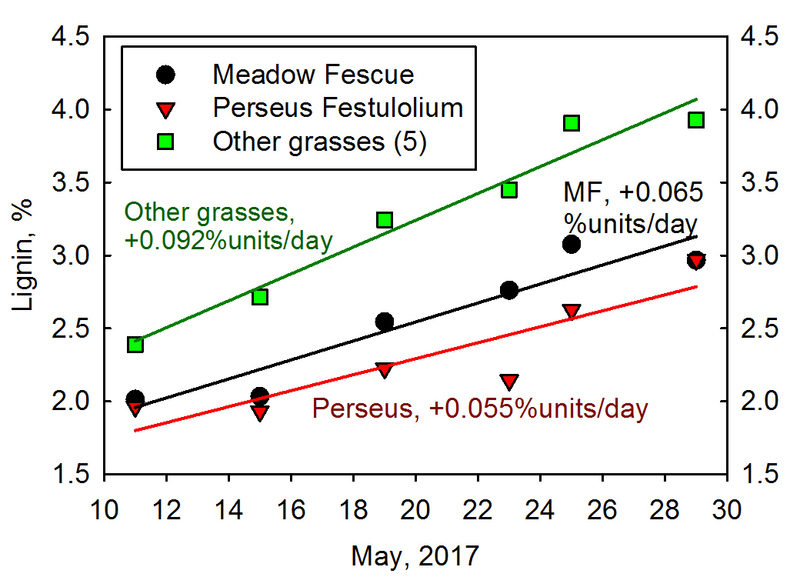 At the time of a typical spring harvest, meadow fescue is similar in NDFD to Perseus festulolium, and is 11% higher in NDFD than other grasses. Fig. 8. Fiber digestibility of grasses in spring growth. Lignin content of meadow fescue and Perseus festulolium did not differ, but both were significantly lower than all other grasses (Fig. 9). Also, lignin accumulates at a slower rate for meadow fescue and Perseus, compared to other grasses. On May 20, meadow fescue was 22% lower in lignin than other grasses, excluding Perseus. Fig. 9. Lignin content of grasses in spring growth. We have collected 19 meadow fescue varieties from North America and Europe that will be sown as pure grass stands in Ithaca, NY and Burlington, VT this spring. Heading dates and quality data will be gathered in 2019. We will also plant these meadow fescue varieties in binary mixtures with one alfalfa variety in Ithaca and in Lewis County, to evaluate competition and grass percentage of mixtures. On May 25, 2017, a typical central NY date for spring harvest, grass averaged 20 percentage units higher NDF than alfalfa, but also averaged 23 percentage units higher NDFD. Among alfalfa varieties, HarvXtra types were slightly lower in NDF, somewhat higher in NDFD, and much lower in lignin content than other alfalfa varieties. 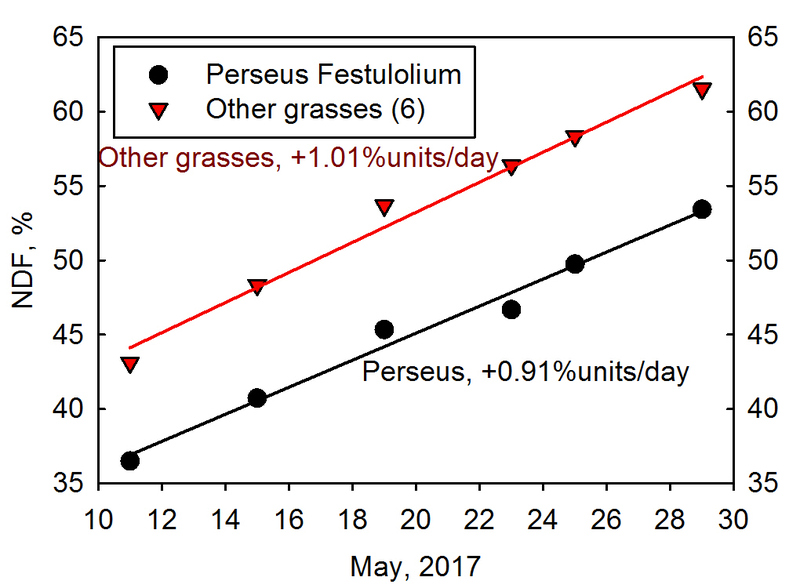 Being a predominantly ryegrass-type of festulolium, Perseus was very low in NDF and high in NDFD in spring growth, but typically heads out in regrowth, resulting in relatively low quality regrowth forage. Meadow fescue is high in NDFD and the decline in NDFD per day is not as great as with other grasses. On May 25, this resulted in meadow fescue NDFD being 11% higher than other grasses, except Perseus. While meadow fescue is consistently higher quality than other grasses commonly sown in the Northeast, it is not necessarily better in some other regions of the country, particularly if the location is near the southern limit of meadow fescue’s productive range. The relatively rapid decline in forage NDFD in spring growth (nearly 1 percentage unit/day) makes a timely spring harvest critical for high forage quality.